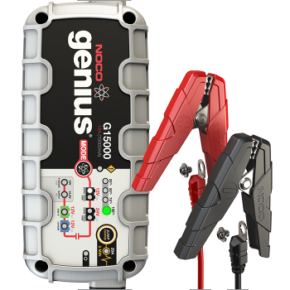 The Noco genius range of multi purpose battery chargers are next generation technology. These ultra safe smart battery chargers can be used on batteries for cars, boats, motorcycles, trucks and more. 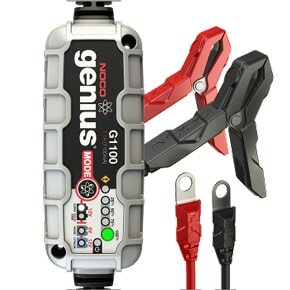 The G1100 battery charger is suitable for 6v & 12v batteries up to 40ah. This UltraSafe Smart Battery Charger is perfect for charging motorcycles, ATVs, snowmobiles, personal watercraft, lawn mowers and more. Extremely effective for maintaining automotive, marine, RV, powersport, lawn & garden and deep-cycle batteries. Its compact, yet powerful form factor allows it to charge batteries 2X faster than ordinary chargers, and one of the safest, most advanced charger on the market. The G3500 battery charger is suitable for 6v & 12v batteries up to 120ah. This UltraSafe Smart Battery Charger is perfect for charging cars, boats, trucks, UTVs, lawn mowers and more. Extremely effective for maintaining automotive, marine, RV, powersport, lawn & garden and deep-cycle batteries. Its compact, yet powerful form factor allows it to charge batteries 2X faster than ordinary chargers, and one of the safest, most advanced charger on the market. The G7200 battery charger is suitable for 12v & 24v batteries up to 230ah. 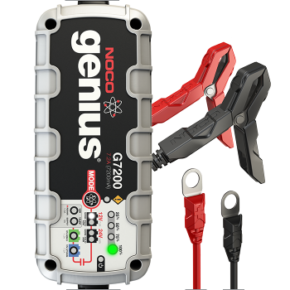 The G7200 UltraSafe Smart Battery Charger is perfect for charging cars, boats, RVs, trucks, tractors and more. Extremely effective for maintaining automotive, marine, RV, powersport, lawn & garden and deep-cycle batteries. Its compact, yet powerful form factor allows it to charge batteries 2X faster than ordinary chargers, and one of the safest, most advanced charger on the market. The G15000 battery charger is suitable for 12v & 24v batteries up to 400ah. 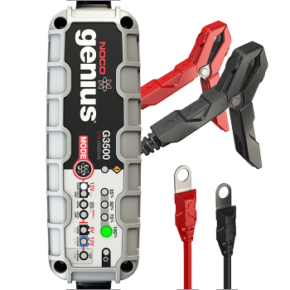 This G15000 Pro-Series UltraSafe Smart Battery Charger is perfect for charging cars, boats, RVs, trucks, tractors and more. Extremely effective for maintaining automotive, marine, RV and deep-cycle batteries. A professional-grade charger for those that demand maximum performance - outperforming ordinary chargers by 2X.